A fantastic new 20 Watt wide band low distortion Mono/Stereo amplifier module with full overload protection. Featured in EPE May 2005 Issue. This single chip stereo amplifier module delivers a maximum power of 11 Watts per channel into 2 ohms, or 20 Watts into 4 ohms in mono full bridge mode. It also will drive all higher impedance (such as 8 ohm) loads at reduced power levels. * Distortion below 0.03% at 1 kHz. * Output AC and DC short circuit protection ­ to ground and to supply voltage. * Loudspeaker protection ­ both outputs shut off in any overload condition. * Chip overheat shut down protection. * Clipping detector output shows if either channel is overdriven. * Standby switch off function - very low standby current. * Delayed turn-on mute circuit eliminated switch on/off noises. * High supply ripple rejection. * Wide output voltage swing makes maximum use of the available supply. The circuit board has been designed to allow operation in stereo or mono (bridge) mode ­ selectable by a wire link. Operating voltage can be between 8 and 18 Volts so the circuit is perfect for use in car systems. The power output ratings are continuous average power and assume a suitable heatsink is fitted. 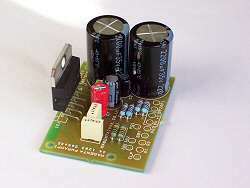 The board has separate connecting points for loudspeaker, power, and input ground connections. The specification and measured performance of the circuit are impressive, it uses very few components and provides an effective power amplifier for many audio applications. With short circuit protection, a clipping indicator, shut down mode, and switch on/off pop reduction features this circuit is very versatile. The power output of this module is real continuous average power (sometimes incorrectly called r.m.s power) which heats up the load resistors! It should not be confused with terms such as my 80 Watt computer speakers that are powered from a wall transformer rated at just 6 Watts! The price includes a suitable heatsink (not pictured), and all components to build either the Stereo or the Mono (full bridge) circuit.